Obamacare may be on the way out. 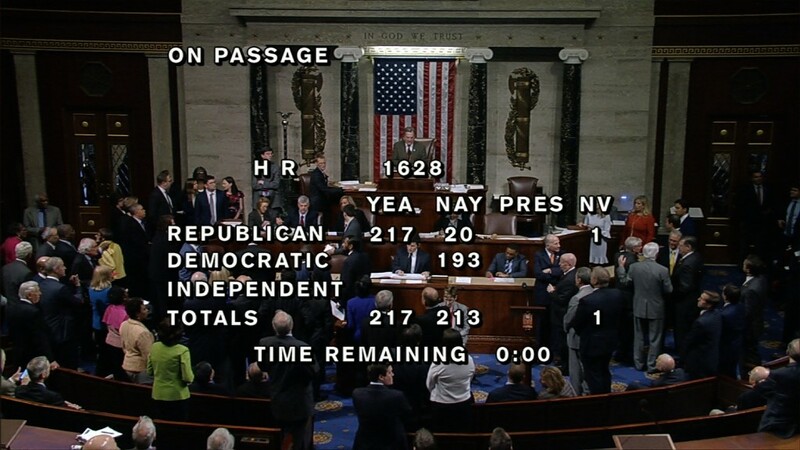 Thursday afternoon, the House of Representatives approved a bill aimed at repealing the Affordable Care Act. The bill now moves to the Senate, where it is likely to face substantial revisions. It's the latest twist in a health care saga that many people outside the United States find bewildering. But does any major developed economy have the perfect solution? 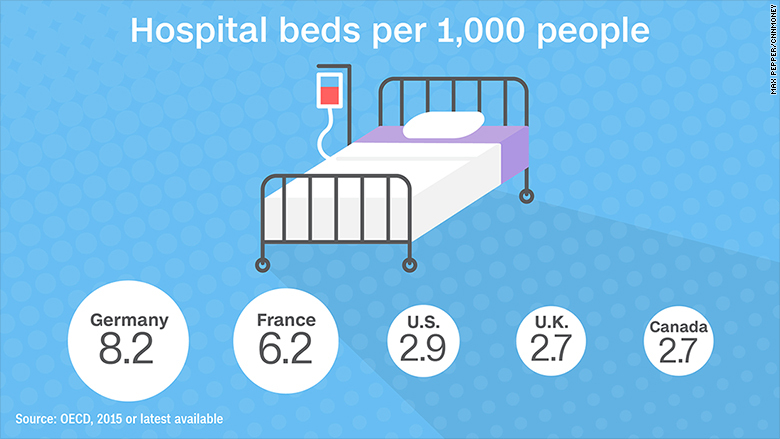 Turns out that many health care systems around the world aren't in great shape either. The U.K.'s public health system is called the NHS. It's financed through tax and compulsory national insurance contributions, but faces serious financial problems. The accounts of two-thirds of NHS providers were in the red in 2015, with a combined deficit of £2.5 billion in the latest financial year. Prime Minister Theresa May has promised to increase funding, but opposition lawmakers say much more is required to repair deficiencies. Related: Why are England's hospital doctors so angry? Care is free at the point of delivery across the U.K., but long waiting times and a limited choice of hospital or physician can be a problem. That's why roughly 11% also have private insurance, often offered as a perk by employers. Hospital doctors went on strike last year, because the government decided to impose new employment contracts. The doctors say the new system is unfair and unsafe, because it could force some to work shifts without enough rest between them. 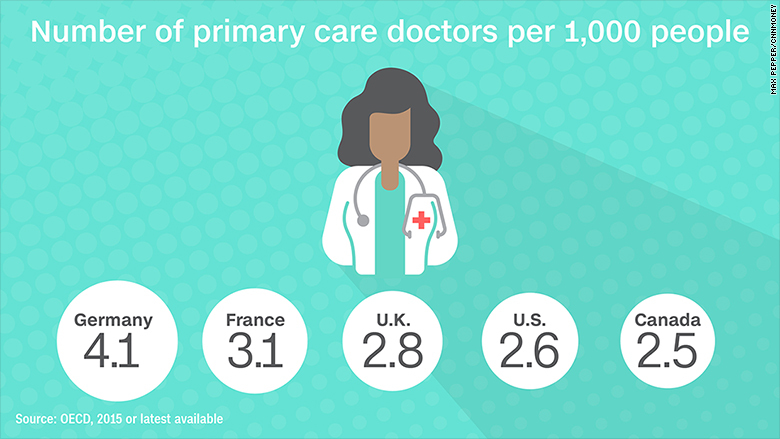 As in the U.S., health care is a major political issue. Germany has a multi-layered system financed by a system of mutual insurance funds. Every employee must belong to one of the insurance funds and contribute according to their income. The cost is split between the employee and employers, and most of the cost of treatment is paid by the funds. 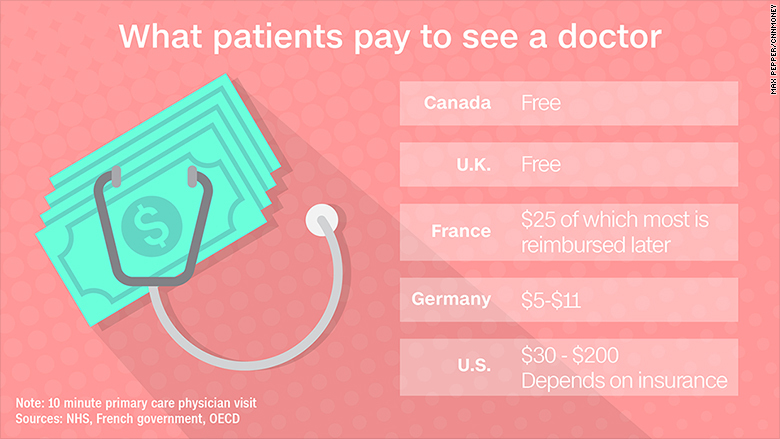 Patients only pay a small fee to see a doctor. Higher earners are allowed to opt out of the public system and pay for private insurance instead -- an option chosen by roughly 10% of Germans. Under the current system, Germans can choose which doctor to see, including specialists or consultants. Figures from the OECD show Germans see their doctors more often, get more prescription medicines, have higher hospital admittance numbers, and longer hospital stays than people in other developed countries. That can lead to inefficiencies. A 2013 official review of 2 million hospital stays in Germany found "overtreatment" in 40% of them, including unnecessary admissions for procedures that could be done on on outpatient basis. The system is also under increasing strain because of Germany's aging population. 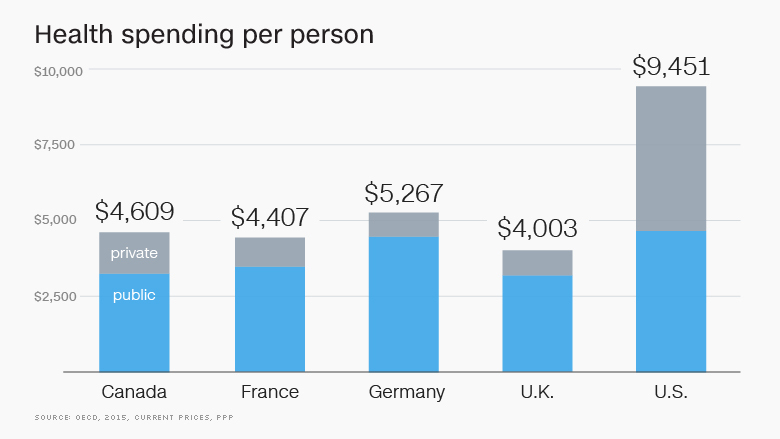 The generous French health system has been ranked highly by the WHO and Euro Health Consumer Index. Everyone is covered by mandatory health insurance, which is taxpayer funded. Patients are expected to pay for roughly 20% of the cost of their treatment. 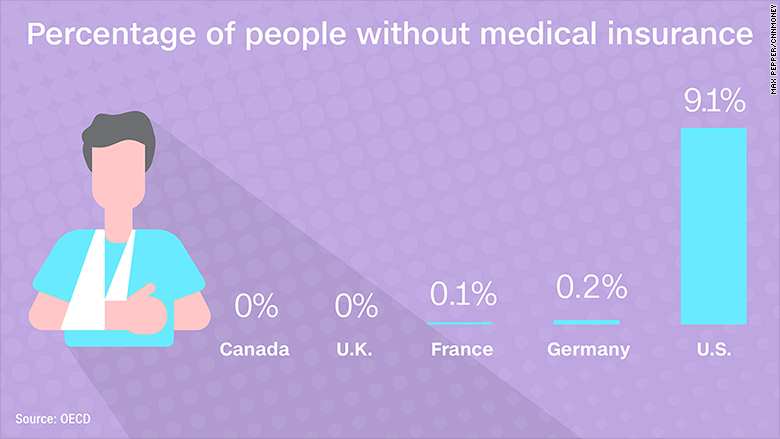 However, more than 90% of French people also hold private insurance, usually provided by employers, which covers the patients' share of the cost. The private premiums are based on income, rather than health risks. The French system suffers from a chronic deficit, which was made even worse by the global financial crisis. Because the funding relies on employee contributions, higher unemployment blew a hole in the health care budget. The government is trying to respond by insisting on greater use of generic medicines. It has cut the deficit and wants to achieve a surplus by 2019. But the reforms, including cuts in what's covered by public insurance and attempts to increase the level of patient payments, are proving very unpopular. Canada has a government-run national health insurance, funded by tax receipts. It is organized on a regional basis, with each province adopting slightly different rules. It ranks highly for quality of care, with lower incidence of heart disease and stroke mortality, highly rated cancer care and above average life expectancy at birth. But waiting times, especially for elective surgeries such as hip and knee replacements, can be a problem. According to a 2015 survey by the Fraser Institute, Canadians have to wait 18 weeks on average before receiving specialist treatment. That's one of the longest waits in the developed world. The Commonwealth Fund, a foundation that studies health systems, said in 2014 that Canada ranked behind Australia, the U.K., U.S., France and Sweden in terms of patient experience with waiting times. Private insurance for public services is illegal in several provinces, with only a small number of doctors able to accept private payments for speedier access to care. That's why some Canadians chose to travel abroad for private treatment -- although the problem is far smaller than it's sometimes made to look. In 2015, 45,000 people received treatment abroad, less then 0.2% of the population.